Tangled and True: the perfect summer salsa. My friend Sara passed along the perfect summer salsa. Light, fresh and delicious. 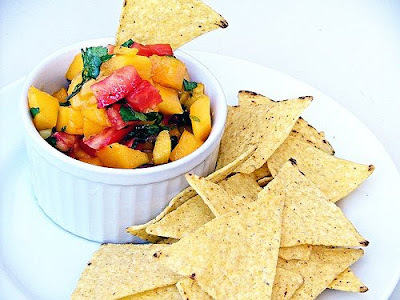 My husband LOVES mango salsa, but I just can't bring myself to try it. I can't make my mind belive that mangoes should ever belong in a salsa! I think I will try this recipe for my husband though. It has been a while since I made mango salsa. My recipe is a little different but you've inspired me to whip some up.